There are many good reasons to stay at the Hotel Petrisberg: an exceptionally quiet location, removed from the noise of the city, an incomparable vista of the city with its historical monuments, plus the amenities of a city hotel. The Hotel Petrisberg is beautifully located at the edge of downtown Trier. 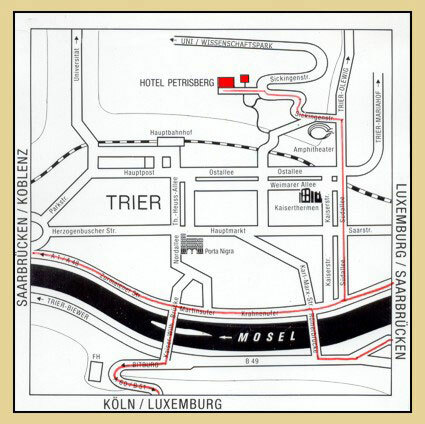 Just follow the directional signs to the "Amphitheater" and "Trier-Olewig." Turn left just after the Amphitheater into Sickingenstrasse. After a few hundred yards/meters, you're there!